I always like to try to give local bands a boost if possible and so today I am writing a review of Kuopio, Finland’s Omniversum. The band just released ‘Demigods’ and I was approached by them and asked if I would mind giving it a listen and of course I do not. So here we go! 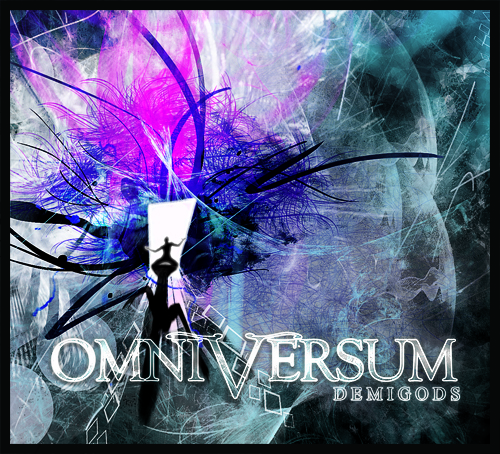 Omniversum plays a style of music that I find somewhat hard to describe but they also have a style or styles that I know I have heard before. I guess that is because they have mixtures of 90’s/neo techno, Euro heavy metal and just a bit of something else that give them a sound that almost makes you feel they come from another time period or place. As mentioned they have a techno/electronica sound, so many of the songs have a lot synth sounds mixed in with heavy guitar work and vocals. The album starts out with ‘Demigods’ which to me was the one track that I personally found a little uninteresting. Luckily the next track ‘The Tomb’ picks up where ‘Demigods’ let me down and I found this track one of the better ones on the album. It has something catchy about it and is a fun listen. I also consider this one a highlight of the album. Also the rest of the album for the most part keeps up with ‘The Tomb’ in being good songs with some variations in vocal style where we get some really harsh screams going on in some of the songs but overall everything is pretty even in terms of quality. I do want to mention the production of the album in a little more depth as I feel for Omniversum this plays a big factor in their unique sound. The album is produced really well and though we have a lot of techno type elements the album also feels organic and warm in terms of the sound which is always a good thing. However, my one complaint with the production is how the singer is mixed in. I know in modern studio recordings each member records their parts separately and the studio engineer then takes all the parts, mixes them together and boom you have an album that sounds (hopefully) like one band playing as a complete unit. My problem with how the singer is mixed is that he sounds a) a little TOO in front of the rest of the band and b) it really seems like the singer is detached from the rest of the band and he is singing along with music in the background not singing in a band. This isn’t a GLARING problem but it is noticeable, at least to me. Otherwise the album is very solid production wise. ‘Demigods’ boasts 6 tracks with one bonus track that is a nice piano piece with a guest female vocalist. I found the album to be an enjoyable listening experience and something that I feel I could put on and listen to in the background or at parties that other people wouldn’t mind hearing. If you are looking for Finnish band that doesn’t sound like other Finnish bands whether it is metal or otherwise Omniversum’s ‘Demigods’ offers a unique type of music that most will find interesting and intriguing at the same time.